Harvest Beer Festival: Drink for Old Faithful. Beer Fest #926...but who's counting? It’s almost Thanksgiving and you know what that means. Six days to whoop it up before the relatives descend and/or you have to deal with that damn bird. 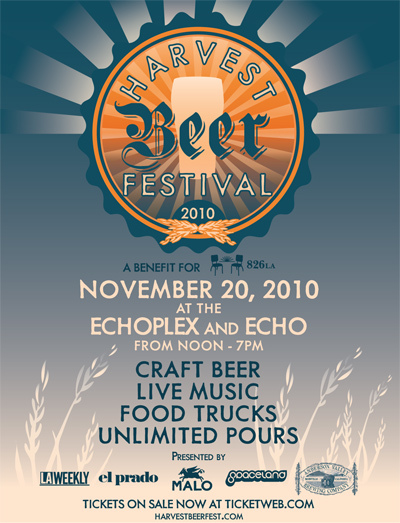 So put down the angst-inducing grocery list and head to the Echoplex tomorrow afternoon for the Harvest Beer Festival, which is promoting the “responsible appreciation of craft beer”. To make sure that you appreciate to the fullest: unlimited pours. For $30, you can forget all about the imminent finagling of that frozen fowl and sample unlimited sips from over 50 beer crafters including: Kern River Brewery; Eagle Rock Brewery; Hanger 24 Craft Brewery; Firestone Walker; Bear Republic Brewing Company;and The Bruery. Proceeds from the 21+ fest fund local writing/tutoring project 826LA and the California State Parks so you’ll be guzzling for good. There will, of course, be for-purchase food at trucks on-site to help soak up those suds, which is where the “responsible” part comes in. Those expecting brass with their beer won’t be disappointed. Horn-endowed Vaud and the Villains and The Blasting Company will bring the “oh yeah” instead of the “oom-pah-pah” and bluegrass fans can expect an extra spirited rendition of Last Round Down‘s Why Would I Leave My Beer So Far. Tomorrow, that definitely won’t be your problem.